Addressing simultaneously shipping emissions and financing climate action in developing countries is the best chance of progress. This is our view in a guest commentary: Two birds with one stone , published in the Carbon Market Europe, by Point Carbon (in the context of the IMO MEPC 59 session, 13-17 July, in London). 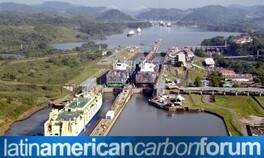 The approach was recently debated as a way forward at the Latin American Carbon Forum, 24 - 26 June, in Panama. The presentation, Beyond Offsetting of Emissions from International Transport, is available . "This opens a possibility of agreeing a differentiating shipping mechanism under the UNFCCC in Copenhagen in 2009, with the IMO implementing an enforcement mechanism. Such a mechanism could then start rapidly as no new convention or treaty would be required." Such pragmatic approach has been praised by number of participants at the Latin America Carbon Forum as a way to reconcile the needs of reducing global shipping emissions with the principle of common but differentiated responsibilities under the climate convention. All presentations are available at the Forum website.